Although our legs may not exactly look like Victoria’s Secret Angels (cue Kendall Jenner’s lengthy stems) , that doesn’t mean we don’t have high aspirations. And when a recent evening wedding look called for bare arms and gams, the thought of exposing our winter-white limbs to such a large crowd caused a bit of faintness. Tan and sun-kissed was not the goal; rather, smooth, even skin tone with just a bit of glow was desired. 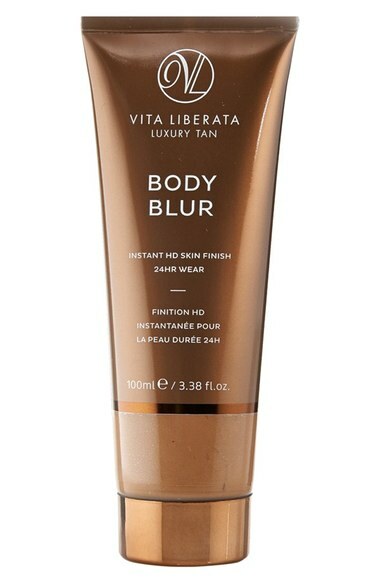 Enter: Vita Liberata Body Blur Instant HD Skin Finish ($45). The very thought of body makeup seems a bit cringeworthy, so although this product falls into that category, we prefer to just call it a tinted lotion. The wash-off product is meant to perfect skin with just a bit of tint, while also reflecting light for Insta-worthy moments. It also masks imperfections, smoothing over stubborn keratosis pilaris or blemishes. It gets extra brownie points for being certified organic and living up to its promise of minimal transfer. For application, we highly recommend using a mitt for even coverage. Going area by area, apply small dots along your limbs and blend thoroughly with circular movements. Voilà! Skin that is smooth, glowing, and significantly more perfect looking than two minutes prior to use. As we mentioned, this product has minimal transfer. That being said, we suggest a quick shower at the end of the night if you plan on hopping into high-thread count white bedding.